Pros: Rawlings has truly created a worthy youth bat for 2016. The VELO YBRV11 will help take you or your player's game to the next level. Cons: The 2016 Velo is hot out of the wrapper, but don't forget to properly break it in. When it comes to the ideal youth baseball bat, traits such as bat weight and balance are critical factors. But bat manufacturing innovator Rawlings knows that there is much more to a great youth bat than just balance. A great bat has features that come together to teach a youth player how to make good contact with the ball and place the ball wherever they want it to be placed. A great bat is as much a teacher as it is an instrument to a youth baseball player. When Rawlings puts out its new lines of youth bats every year, the baseball world expects each line to have innovations that set them apart from the rest of the youth baseball bat world. The 2016 Rawlings VELO YBRV11 bat is proving to be every bit as much of a valuable teacher as an effective piece of equipment for youth players of all ages. 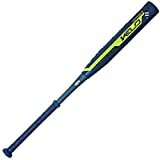 There are a lot of very good reasons for your youth player to consider swinging the Rawlings YBRV11 youth baseball bat. In the past, Rawlings VELO bats have been made using a one-piece construction process that creates a stiff bat with a recognizable sound as the bat makes contact with the ball. But with the new generation of VELO bats, Rawlings has implemented a two-piece construction process that creates a bat made of carbon fibers and fiberglass that has completely altered the way the VELO bat feels to each hitter. Why did Rawlings make the change in its VELO manufacturing approach? Because a two-piece bat can offer more control and better contact than a one-piece bat. The barrel is specially designed to allow for a larger sweet spot and the point where the handle meets the barrel is able to absorb energy and reduce the vibration that comes from contact. It is a design change that will allow youth hitters to become comfortable with their swings without the damaging vibrations that come from other bats. Expanding the sweet spot and making the 2016 VELO youth bat from lighter materials is only the beginning for Rawlings. To make sure that every youth player gets the most from this new line of youth bats, Rawlings has also utilized 3C technology to maximize the design of the YBRV11. Rawlings’ 3C technology stands for consistent, composite, and compaction. It means that the consistent weight distribution throughout the YBRV11 using its composite materials creates a compaction that gives a youth hitter the ultimate hitting power. The combination of these three elements comes together to help a youth hitter make the most of each swing and get the exact results the hitter wanted. The Rawlings YBRV11 youth bat is certified by all of the major youth leagues in the United States. The -11 weight to barrel length ratio means that this bat is perfectly balanced for every youth player and allows for maximum control through each swing. When you are looking for a bat that will allow your youth hitter to get the most out of their game and teach your youth hitter how to find their swing, then you want the Rawlings 2016 YBRV11 bat. This is a bat with all of the innovations you expect from Rawlings and all of the latest technology that has helped to make Rawlings bats the very best in the youth baseball world. Rawlings Velo YBRV11-29 Baseball Bat 29" / 18oz. Got this one for my kid and now he can hit em just as far as his friend and his new $800 torq!